The Boddy House built in 1937 by architect James Dolena at the Descanso Gardens. On April 16th, Pasadena Showcase House for the Arts (PSHA) opened their 2019 Design Showcase House for an exclusive press-only preview. As a notable interior design firm and social media influencer, Sarah Barnard Design was invited to attend the press viewing and capture a sneak peek of the house, which opens later this month. While the select group of visitors was allowed to take photos, no guests will be allowed to take pictures or use cell phones once the event officially opens. This year’s design showcase is located at the historic Boddy House on the grounds of the beautiful Descanso Gardens. Notable Los Angeles architect James E. Dolena designed the home in 1937 in his trademark Hollywood Regency Style for E. Manchester Boddy, owner of the former Los Angeles Illustrated Daily News and founder of the Descanso Gardens. Now owned by the Los Angeles County and considered a house museum, Pasadena Showcase House for the Arts selected the Boddy House to be transformed by interior designers for the 43rd annual showcase event. Each designer was assigned a room of this bi-level garden estate to makeover resulting in the complete rehabilitation of the historic property. Hearkening back to the Hollywood’s “Golden Era” the designers offer a contemporary reinterpretation of the original Hollywood Regency Style abound with opulent detail, vibrant patterns, and bold color schemes. Surrounded by lush gardens in the full bloom of Spring, the designers incorporate botanical inspiration throughout. Floral wallpapers, nature-inspired furnishings, and organic sculptures bring new life to the home. Pasadena Showcase House for the Arts, a non-profit, all-volunteer organization, runs this showcase house as a fundraiser for their charity work and welcomes nearly 25,000 visitors each year. All money raised from this event will support local music programs. Designers from all over California come to take part in the making of this project to benefit the community. See this year’s crop of designers, who generously donated their time and expertise, here. Sarah Barnard designs healthy, happy, personalized spaces that are deeply connected to nature and art. To learn more about Sarah Barnard Design, please visit www.SarahBarnard.com. To learn more about Sarah Barnard Design visit sarahbarnard.com. Photography by Steven Dewall and Abby Siniscal. Happy spring! A “superbloom” has popped up all over California in the past few weeks, a result of a record-breaking amount of rain this past winter season. Bright orange poppies, desert lilies, yellow and white evening primrose, and pink bigelow monkey flower, are some of the flowers blossoming in huge numbers to the delight of hikers, tourists, and nature-lovers throughout California. The superbloom has people flocking to parks such as Walker Canyon in Lake Elsinore, Near Desert Lily Sanctuary, and Diamond Valley Lake. Close up of a wild poppy. 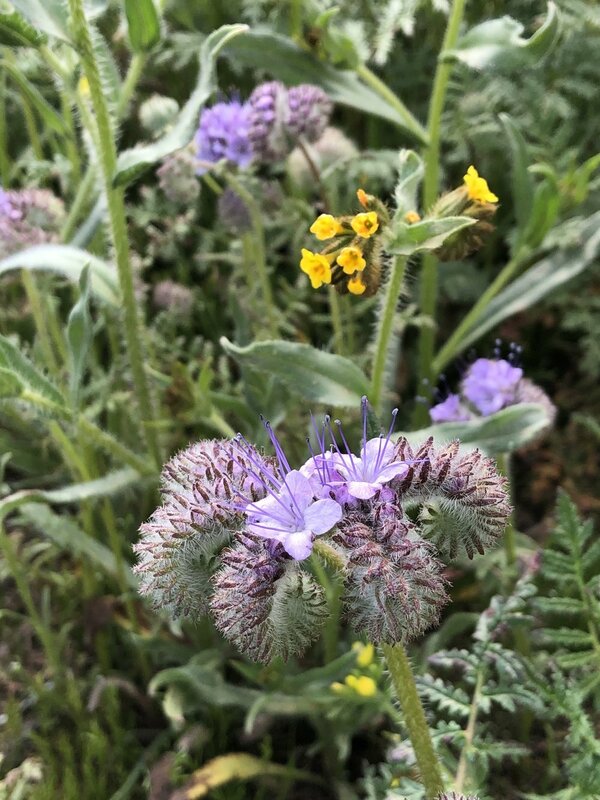 Barnard recently took time to visit Griffith Park, Antelope Valley Poppy Reserve and Anza Borrego State Park to see the superbloom herself. Sarah, who specializes in interior design that contributes to her client’s health and wellness, and strives to make nature a part of each home she creates, shared photos of her recent trips. “This year’s superbloom is a colorful reminder that nature informs life and design,” Barnard said. Incorporating this principle into the design of your home is one way to contribute to your happiness and health. The study of the effect of nature in design on our health is called Biophilia, and we have previously written about this phenomenon. One way to bring this happy and healthy nature into your home is to incorporate natural and organic forms, which are visually pleasing and encourage our connection to the outdoors. Selecting art, lighting or furniture for your home that resembles natural forms is one way to make an inviting and interesting space. Art and forms inspired by nature could mean a light fixture that looks like a plant or a sculpture that looks like an animal. Fresh flowers and bright pink leather reminiscent of wildflowers create a warm and inviting dining nook. Cheerful coral pink tile pairs beautifully with flowers. 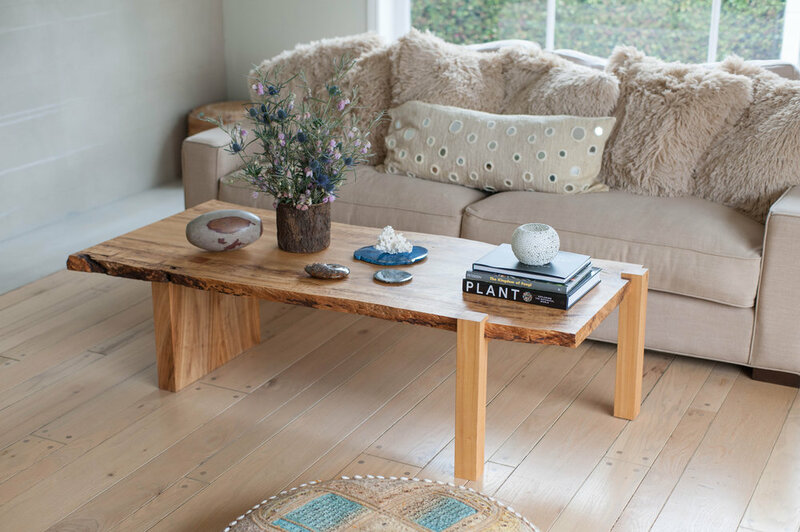 Using natural materials, aside from being beautiful and adding rich texture to a space, is also good way to contribute to mental and physical well being. Having materials like wood, cotton, and glass rather than plastic and vinyl will avoid toxic off gassing. This dining room features fresh flowers, bright colors, and natural wood tones. This colorful palette was inspired by flowers. Fresh flowers add life and warmth to a contemporary space. To battle the stresses of every day life, you can use mindful interior design practices to create open spaces connected with the environment, plant-life, and the seasons. Barnard reminds, “Our mental, physical, and emotional health are deeply and immediately impacted by our surroundings. A visual connection with the outdoors can improve mood and productivity, and what we bring into a home or space (finishes, furniture, artwork) determines both the quality of the air we breathe and how we function in our daily lives.” The flower fields make great inspiration for such a space, with their bright colors, gorgeous views, and fresh air. There is energy, beauty, and vitality in wildflowers. Spring is the perfect time to find inspiration from flower fields and create a connection to the outdoors. You can do this through beginning a garden, using interior design to personalize your home or office, meaningfully incorporating plants, natural light, and elements inspired by nature. Choose natural materials like wood, cotton, and linen, and take inspiration from this season's superbloom by using bold and bright colors. As more and more of us make our careers our focus, nature and design are more essential than ever to promote calmness, serenity and healthy living. And when in doubt, go hiking!